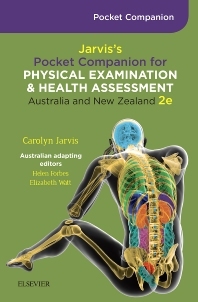 Jarvis’s Physical Examination and Health Assessment Pocket Companion is the perfect clinical placement guide and bedside resource. Written by Helen Forbes and Elizabeth Watts, this must-have text provides the essential steps for health assessment in an user-friendly, pocket size format. This updated second edition highlights the contrast between normal and abnormal findings, focusing on symptom, risk and function.